Bright Club St Andrews: Bright Club St Andrews IV: Duck the Halls (with x of folly)! 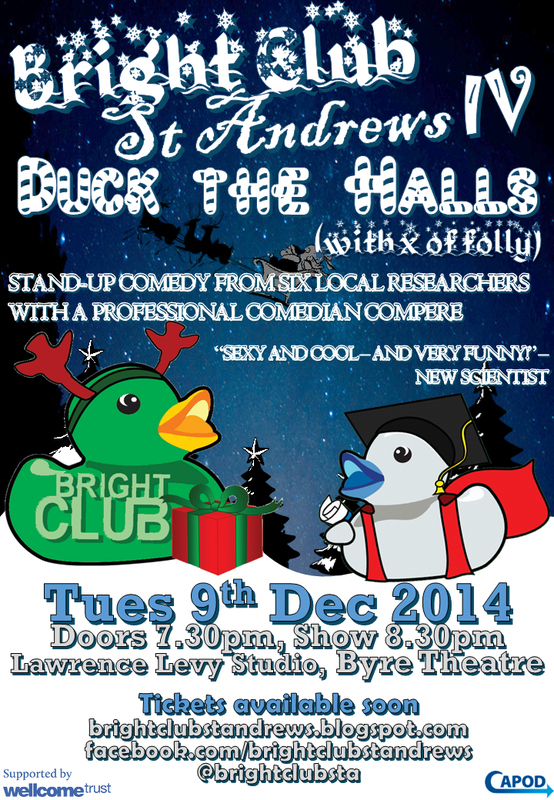 Bright Club St Andrews IV: Duck the Halls (with x of folly)! We're going back to the Byre! Our next show will be on Tuesday 9th December in the Lawrence Levy Studio at the Byre Theatre, and will be Christmas themed. Interested in performing? Contact us! We'd love to have you! Interested in watching? Stay tuned for ticket details in due course. All of the videos from our Halloween show are now up on our youtube channel. Go check them out!